Early this summer we planted two rows of different types of tomatoes in our vegetable garden. We are so pleased with the results that we are now planning to only plant tomatoes next summer along with some basil. Tomatoes are easy to grow and are very nutritious. They turn out incredibly tasty and harvesting them is truly gratifying. 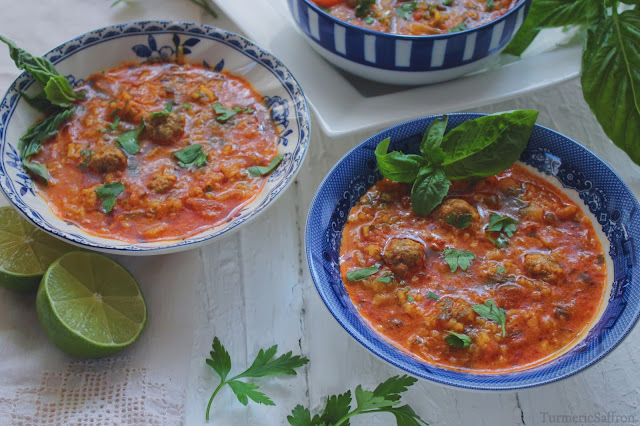 There are many Iranian recipes that call for tomatoes, tomato sauce or paste. 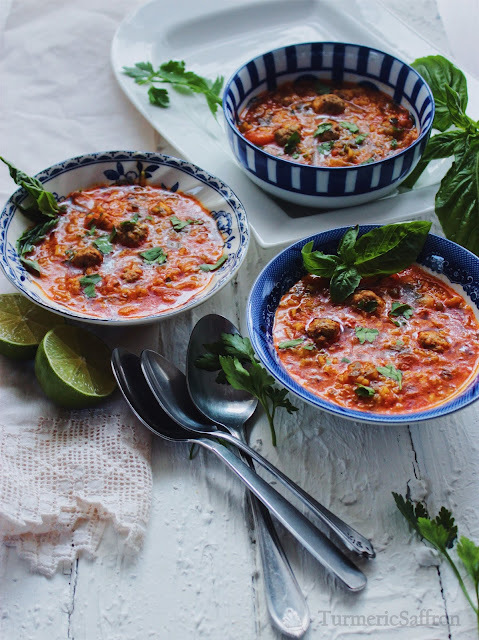 These recipes include dizi, khoresh gheymeh, khoresh bademjan, and estamboli polow and they are usually served with a side of salad shirazi: a simple salad with tomatoes, cucumber, and onion. A ripe and juicy tomato wedge wrapped up in a warm lavash is also a great snack on any given day. As we are nearing the end of summer, there's still time to take in the sunshine, walk on the beach, and enjoy the abundance of fresh summer produce. With tomatoes still in season it's time to make آش گوجه فرنگی Ash-e goje farangi (tomato soup). 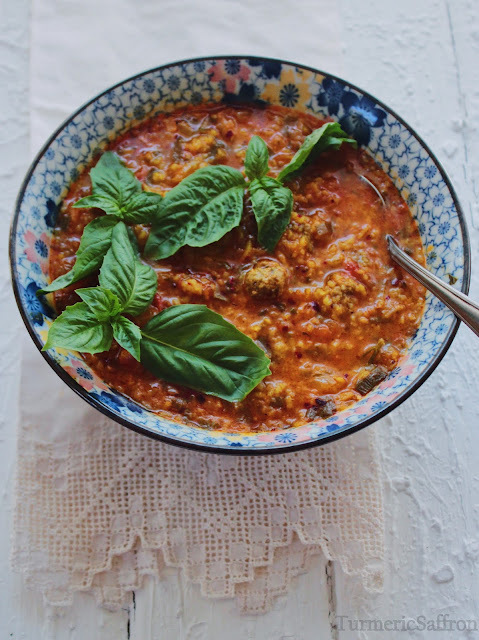 This is a very flavorful soup that can be had all year round but is especially delicious as a late summer soup. Every region of Iran has its own version of ash-e goje farangi. They may use different kinds of herbs or spices, add beans, or peas. The Khuzestani (southern-style) آش تماته ash-e tamate is hot and spicy. 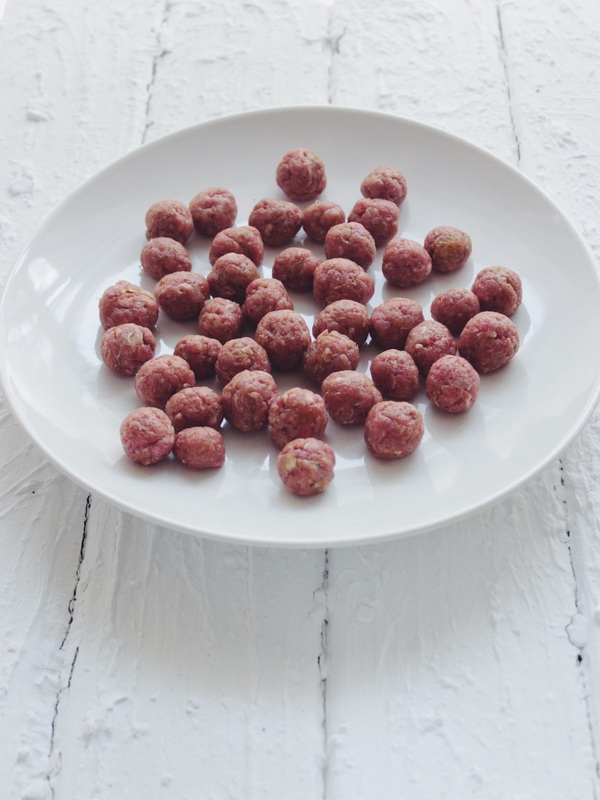 In a bowl combine beef, onion, salt and pepper and shape into mini meatballs. Place on a large plate and set aside. Bring a pot of water to a boil. 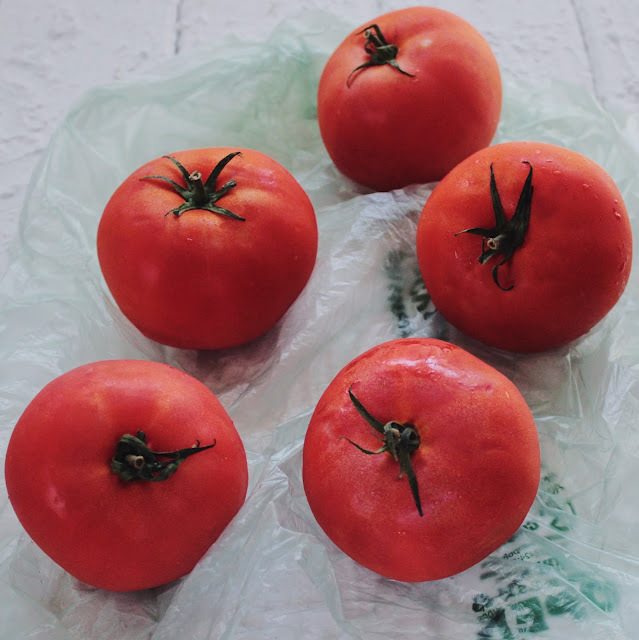 Cut an "x" in the bottom of each tomato with a sharp knife. 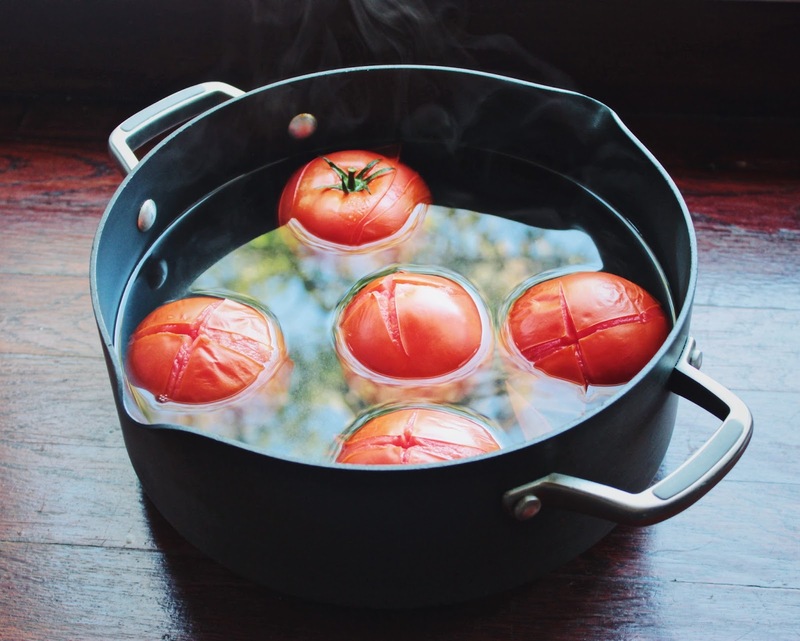 Place the tomatoes in the boiling water and cook for a minute or two. Remove from the pot, allow to cool and peel the skins. Chop or grate the tomatoes on a box grater. Remove the seeds if you prefer. Add 3 tablespoons of oil to a pot, saute chopped onions over medium-high heat until the onions become translucent. Add turmeric, stir and add the chopped garlic. Saute for a couple of minutes. Stir in the tomato paste and cook for 2-3 minutes before adding the tomatoes. Cook for 5 minutes. Add the rice, parsley, scallion, basil, 1/2 teaspoon salt, 1/4 teaspoon pepper and a pinch of red pepper. Add six cups of water, stir, bring to a boil, add the meatballs, reduce the heat, cover and cook over low heat for 45-50 minutes. Periodically, stir the soup and add a little water if needed. Taste and adjust the seasoning with salt and pepper. Add lime juice/verjuice just before serving. Serve hot with fresh herbs and warm bread. For a vegetarian version of this soup you can make it without the meatballs. For a lighter soup you can reduce the amount of rice to 1/4 of a cup. You can drizzle نعنا داغ nana dagh (fried dried mint) on top.